Police Commissioner Gary Griffith, centre, at the launch of the Commissioner’s Cup, yesterday. Also in the photo are assistant Commissioner of Police, community relations, Patsy Joseph, from left, technical director of Football Factory Terry Fenwick, former TT footballer Kenwyne Jones and TT Football Association general secretary Camara David. 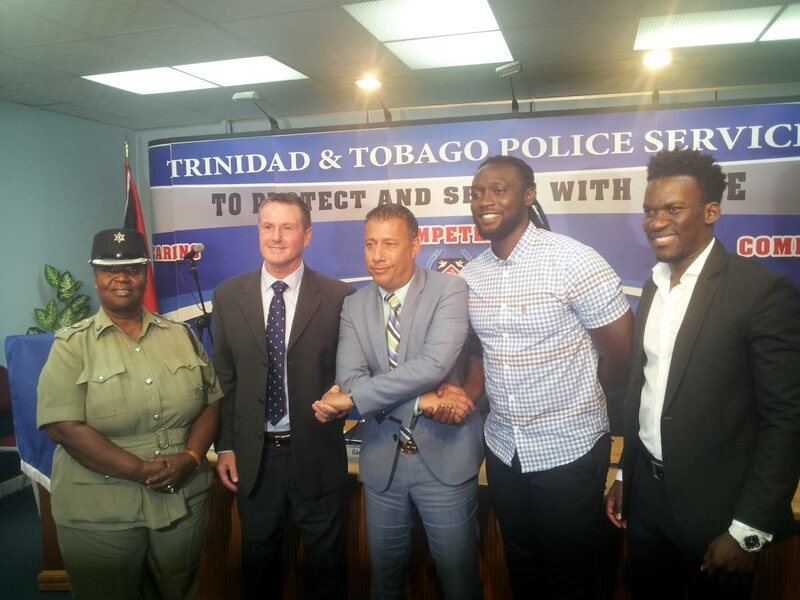 POLICE Commissioner Gary Griffith wants the Commissioner’s Cup to discover new football talent in this country when the tournament kicks off in July. The tournament’s mission is also to develop camaraderie among communities throughout TT. The Commissioner’s Cup will be an Under-17 age group tournament played from July to August and is expected to feature 46 police youth clubs. Exceptional players in the competition will be selected and organisers will try to help them gain football scholarships with further training. Griffith hopes the programme leads to contracts abroad for young players. The CoP said playing overseas will help TT football. Griffith said talent can be found through the Commissioner’s Cup. Patsy Joseph, assistant Commissioner of Police, community relations, said this programme is about entire communities getting involved. Joseph said prizes will be given for the largest attendance at matches, the best rhythm section, the best team chant and teams that are most accommodating to visiting teams. Former TT footballer Kenwyne Jones, who is an ambassador for the league, said, “You have a lot of kids who are very creative, very talented, very expressive in all different facets of sport and in life, and we have to be able to give them that opportunity to see that and to explore those options. The TT Football Association(TTFA) and the Football Factory are also supporting the initiative. The TTFA was represented by general secretary Camara David and Terry Fenwick attended the launch on behalf of Football Factory. Reply to "Griffith: Commissioner’s Cup can find hidden talent"